Validation Gap Analysis is the process of comparing actual performance to an expected performance, to determine whether validation requirements and expectations are being met. Gap analysis seeks to answer the questions “where are we” (current state) and “where do we want to be” (target state). 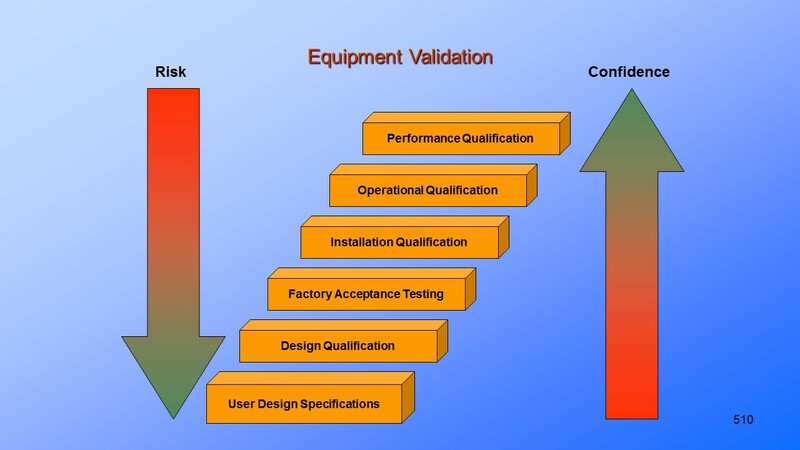 Identify the specific validation expectations or requirements. In regulated industries, validation standards will be determined by the expectations of the regulatory bodies, for example the US FDA, European Competent Authorities and Notified Bodies, the Australian TGA, etc.. The validation expectations may be driven by international standards, or in multinational organizations may be set by corporate standards, or may be set by internal quality and regulatory departments. Regardless of the source of the validation requirements, the key point, is that it is critical that the validation expectations are clearly understood. Identify how you will measure current validation status. An audit of records and procedures will usually be utilized to determine the current situation. This may involve a number of different individuals, reviewing various processes and a range of documentation. There will need to be a defined method of measurement of compliance status versus expectations. The measurement process applied will need to facilitate a prioritization of actions to be taken to address any identified gaps. The method of measurement may be along a qualitative scale i.e. fully compliant, minor gaps, major gaps to requirements, or may follow a quantitative scale, i.e. the level of compliance may be given numerical indicators to indicate the level of validation compliance. Identify the skills, technical competences and resources necessary for those involved in performing the analysis. It is essential that those individuals tasked with performing the gap analysis are fully competent in validation expectations, validation procedures, quality system requirements, change management processes, records management procedures, product and process specifications, etc.. Often no single individual will hold all the necessary skills, therefore a team of individuals will be identified. Those involved in performing the gap analysis may vary from process to process as different technical expertise may be required. Prepare, plan, agree and perform the analysis. Determine the time necessary to perform the validation gap analysis. As there will be a number of individuals involved in performing the gap analysis, time requirements need to be carefully considered. In most organizations, employees are already busy on day to day tasks, therefore any time allocated to support the validation gap analysis will take from other tasks. Equally, the gap analysis must be fully supported by all those involved and must not be compromised due to lack of time commitments. How will the outcome of the analysis be reported? When the analysis is performed, there needs to be a clear report published showing the level of compliance to validation requirements, the number of gaps identified and the potential risks posed to the organization by the gaps in compliance versus the validation expectations. Analyse the outcome of the Validation Gap Analysis. It is important to allocate appropriate time and depth to a review of the gap analysis. The gap analysis may identify situations where necessary validations have never been performed, or may find that validations performed are lacking in some critical details. This latter point is important and the effectiveness of any gap analysis, lies with the technical competence of those performing the analysis. Unless those performing the analysis are technically competent and have good attention to detail traits, then the effectiveness of validations that have previously been performed cannot be truly determined. The gap analysis will provide a documented output in the form of a gap analysis report. This report will normally include, where necessary, recommendations for further action such as repeating a validation, amending a validation protocol and performance of a new validation, or may make recommendations relating to staff training, record keeping, equipment stability, etc.. The report should also reference a “risk review” associated with any gaps identified and highlight any higher level risks which may need prompt action. Implement a plan to address “unacceptable risks”. Where gaps are identified and need to be addressed a plan should be agreed and implemented. Depending on the gap identified, this may encompass procedure updates, retraining, equipment upgrades, re-validations, etc.. Whenever change is required, there should be a defined change control process in place to ensure the implementation of solutions to gaps identified, do not in themselves raise new gaps. Medical Device Validation. Information and training presentation.